Established in 2012 by Stephane Gerard, Junior CEO of BYOTA INC., to honour is Grand-Mother’s love for children and his desire to help those less fortunate. The Foundation is committed to providing school supplies, health care supplies, clothes and food to the children of Haiti. Despite recent improvements in some areas, Haiti continues to be the poorest country in the Western Hemisphere. 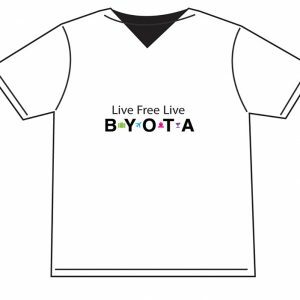 BYOTA T-Shirt apparel are entirely Made in Canada. That means that the imported thread (no cotton growers in Canada yet) is knitted, dyed, cut and sewn, and then printed or embroidered in Canada. The imported organic cotton and recycled polyester threads are knitted at Canadian knitting mills thus supporting jobs in the textile industry in Canada The 50/50 blend is made of organic cotton and recycled polyester, providing the best of both worlds, the softness of cotton and the durability of polyester. Once knitted BYOTA T-Shirt fabric is dyed in a Canadian dyehouse. The BYOTA T-Shirt collection is made of organic cotton certified under the GOTS standard, encompassing growth, harvest, transformation, use of chemicals and labour conditions in cotton production. Thanks to our talented team of graphic designers BYOTA INC.can offer creations that will allow you to stand out from the crowd.These original designs are enhanced by a combination of advanced identification techniques,including screen printing and appliqués. Thus, we are able to offer local products that combine quality, comfort and style,ensuring that every BYOTA garment is worn with pride!